The Apple TV 4K - Is It Worth The Upgrade? After a week of searching, I finally found an Apple TV 4k on Friday. We've had the ATV4K up and running for 2 days now - is it worth the $179 upgrade? Or should you look elsewhere? The bottom line - the ATV 4K is better than its predecessor - and the ATV4 was a revolutionary leap forward. If you have a 4K television - or if you're thinking of picking one up in the short term - you should upgrade to the Apple TV 4K. It has a better processor, so navigating through menus is smoother. The icons and graphics in the tvOS UI are rendered in beautiful 4K. It SEEMS that Siri is running more quickly and responsively - but that is difficult to measure, as it was pretty good on the standard Apple TV 4. In every aspect, this is an improvement on a very good Apple product. BUT.... let's talk about the video quality. That's why we're making this upgrade. As a threshold matter, the jump from HD to 4K simply doesn't pack the same wallop that you experienced when you went from SD to HD. Back in late 2002, I had the first HDTV setup most of my friends had seen. When we hosted a party for the 2003 Super Bowl, people simply could not believe the picture quality. It was a SHOCKING change. 4K, on the other hand, garners a lot of "hey, your TV has a good picture!" comments -- but people aren't flabbergasted. In fact, I'm occasionally unsure if I'm watching HD or 4K - the effective resolution is going to depend upon the original source material. Keep in mind - I have a somewhat early 4K TV - Sony improved its HDR in the year following. AND, I apparently need to upgrade my HDMI cables in order to take advantage of a new chroma format. Also... you're still going to be watching a lot of "standard HD" content. Even when that content is technically available in 4K. If your internet connection has a hiccup, your picture will typically drop to 720p or even lower. We have an ethernet hardwired connection, and it STILL occasionally dropped 4K. Netflix has a bunch of Ultra HD 4K content - but most of their stuff is standard HD. Playstation Vue is ALL standard HD. If Amazon ever gets around to releasing their Prime Video application, I'm sure it will have quite a bit of 4K content, too. But for now -- just realize that your Apple TV 4K is going to be pushing a lot of 1080p content. And it still will look great! If you're asking the question, then you probably have a 4K TV -- and the answer is YES. It may seem like a decent amount of money to spend on an evolutionary upgrade.... and it probably is. But it also makes economic sense. As a rule, the value of electronic equipment drops gradually, and then PRECIPITOUSLY. You will most likely never get as much money for your ATV 4 as you will right now - and the value will only continue to decrease. These aren't collectors' items. I'll update this post with the eventual selling price of our 64 GB ATV 4 - but it WILL defray the acquisition cost of the ATV 4K. 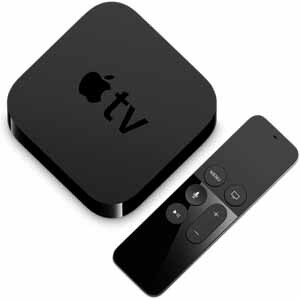 UPDATE - the Apple TV 4 / 64 GB sold for about $115. So the upgrade cost is around $65 - WELL worth the money. Upgrade a year from now, and you'll likely see that your old ATV 4 is a whole lot less valuable. Bottom line - this was a seamless update. With tvOS 11, our Apple TV 4K immediately re-created the home screen from our old ATV 4 -- because every ATV in the house syncs the home screen. Now, let's get that Amazon Prime Video app into tvOS!